Fred E. Miller is a speaker, international coach, and an author. His books, “NO SWEAT Public Speaking!” and “NO SWEAT Elevator Speech!” are purchased worldwide and receiving rave reviews on amazon.com. This is his mantra. No one ever challenges that statement. Why would they? They also know we perceive really great speakers to be Experts. Those with a Fear of Public Speaking don’t take or make those opportunities. Fred shows his clients how to lessen it! He shows them how to Develop, Practice and Deliver Knock Your Socks Off Presentations! with – NO SWEAT! [7:20] Why is You Speech Intro Important. [8:45] How to Pursue Your Passion as a Speaker. [11:00] The Role of a Speaker Coach. Antwon Lincoln has over a decade of experience as a presenter. He has presented to a wide range of audiences at conferences, educational agencies, non-profits, and universities. But he is NOT a professional! Read this to learn more about what he's going to do about this. Public speaking was always my favorite about most of my previous jobs, after a long break from it this podcast made me remember how much I love it! Thanks Antoin! I’m off to join a toastmasters group!! Just a little bit of awesome Antwon. Keep up the good work! Thanks. Really enjoyed Episode 002 and look forward to hearing more and follwing your speaking journey as a help to me as my speaker journey unfolds. I will be speaking to a group of 2,000 next month so this podcast was just what I needed! I will be listening to them all and taking notes and killing it at my next speaking engagement! Wonderful show. Great inspiration, advice and tips on becoming a speaker. Great guests. Really interesting concept and love the high energy from the host! My husband became a speaker a fe months ago and I was looking for more information about how to build his speaking business. This show is packed with a lot of great information. Thanks for sharing this valuable strategies. 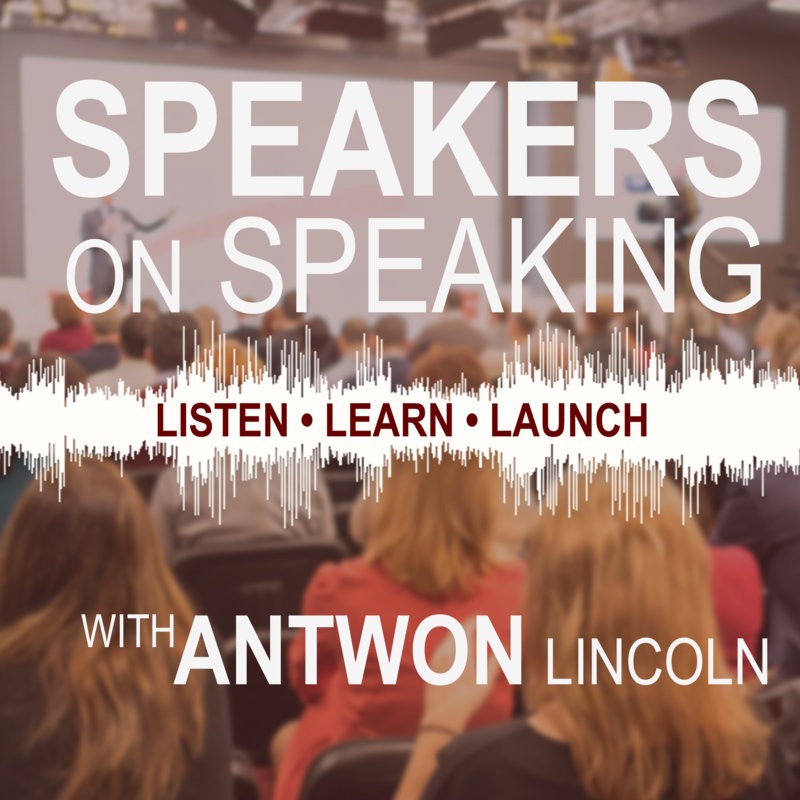 This show provides great practical advice and shares tips from professional speakers to become a better speaker and launch your speaking career. Great weekly content! This is exactly the show I need in my life. I do public speaking as a living, and this show has given me a lot of great tips for improvement. Thank you for this great insight Antwon! I listened to the Debbie Allen episode. I like her take on it. I'm a Toastmaster and always enjoy listening to the opinions and thoughts of people who speak professionally/regularly. I'm excited to listen and learn. Speaking from free to fee, that's what I want too! Thanks for making this show, Antwon. Great pace to the interviews. I’ve put some golden nuggets in my pocket from these episodes. Some of the conversations about establishing fees as a speaker have been very helpful. Nice job! If you are thinking about being a speaker, then you have to listen to this podcast. Great podcast with awesome guests and valuable content! Definitely ready to up my speaking game after listening to this podcast. Very helpful. Keep up the great work Antwon! Really great content and high energy coming from the host! This is one of those shows where right away, when you hear Antwon talk, you can tell he knows his stuff. It’s high quality, and the guests are rockstars. Great work! An Excellent Classroom for Aspiring Speakers! Antwon, this is a podcast after my own heart. I absolutely love it. I love both your authenticity and your mission. Your choice of guest speakers are definitely helping aspiring speakers avoid the pitfalls of choosing speaking as a profession. I wish you all the success in the world and I will spread your message. Keep up the excellent work! Great podcast that helps speakers achieve goals by interviewing the best in the business. I found this podcast energetic and engaging. Dr. Rob provided some handy perspectives on overcoming personal struggles/obstacles. He uses those personal situations to help others see how to navigate through those challenges and find the silver lining for ways to endure and become stronger. I’d love to hear him interview Tony Robbins, Dr. Nick Morgan, Amy Cuddy and other inspirations in my speaking journey in the future. Antwon, the show host, is focused and energetic. He brings guests who know of which they speak and it's a great recipe for learning. Antwon has put together a great resource here for anyone who is already speaking or wants to tap into the industry. Antwon is dynamic, real and committed to his own growth. Nice work! Looking forward to more. I just dove in, and this is exactly what I need as I am working on growing my speaking biz. Keep ‘em coming. The best podcast for public speaking! I am terrified of public speaking and it is something I am working on. This show has been so helpful and inspiring! Thank you!!!! Wow! I'm so glad I found this podcast! Wow! I'm so glad I found this podcast! As a professional speaker, this podcast has amazing tips and advice! Love it and have subscribed! Antwon is an aspiring speaker who is inspiring! I love public speaking and wasn’t sure what to expect with this show…but as Antwon started speaking I knew I found a good show. Darn, he’s really good! I like the show a lot and recommend it to anyone who is looking to be learn more about speaking. Great work Antwon. I’m a subscriber! I look forward to more. Really interesting stuff. Great info and really inspiring for getting speaking gigs and getting into speaking in general. I just listened to the interview with Faydra Koening. I loved her story! Also Antwon does a great job asking good questions. Super cool and useful cast. Everyone needs to be better at public speaking and being at ease with designing talking points and speaking. This shows is very cool and very interesting. I want to be a public speaker so thank you for this. listen, learn, launch! I love it! Great Podcast for developing your voice! Listen today!